The Indian army carried out hugely successful surgical strikes inside Pakistan occupied territory in Kashmir on the night of September 28, 2016, eliminating many terrorists and destroying several terrorist launch pads. You may remember, soon after the surgical strikes were announced, leaders in the opposition like Congress vice-president Rahul Gandhi and Delhi Chief Minister Arvind Kejriwal had raised doubts about whether the strikes took place at all. The opposition leaders had sought evidence about the surgical strikes. Pakistan, on its part, flatly denied that there was no such surgical strike. Exactly one year later, Lt. Gen. (retd) D S Hooda, former GOC-in-C, Northern Command, on Thursday revealed for the first time to India TV how our commandos meticulously planned and carried out the surgical strikes, right from Jammu region to northern Kashmir area, after crossing the Line of Control. 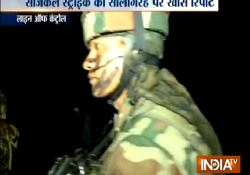 The retired army commander also revealed for the first time how our commandos were sending live stream videos about their action to army headquarters in Udhampur and Delhi. Lt. Gen. Hooda also revealed how the government had decided in advance to announce the surgical strikes to the world at large, in order to convey a strong message to Pakistan. He also revealed how our brave commandos completely smashed four terrorist launch pads inside Pak territory, killing more than 70 terrorists. I hope all those naysayers must have got their answers from what Lt Gen Hooda revealed. And I also hope these leaders will not surely raise doubts whenever our brave armymen conduct such surgical strikes in future too.